Pushing Daisies: Mystery and Suspense on Television. Pushing Daisies starred Lee Pace as Ned, a man with a unique ability: he can bring dead people back to life by simply touching them. However, within one minute he must touch them again to "kill" them or another person in the vicinty dies. With the help of private eye Emerson Cod (played by Chi McBride) and his girlfriend, Charlotte (who he brought back to life but can never touch lest she die), he uses his ability to solve murder cases. 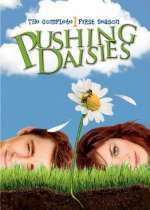 More of a romantic comedy than mystery, Pushing Daisies debuted to critical acclaim on ABC during the fall of 2007. The first season was shortened by the writer's strike. The series was cancelled midway through the second season; the final three episodes were never aired but are included on the 2nd season DVD.